Walking through the stores while looking through the sales racks at the myriad of clothing choices available can be overwhelming and exciting, respectfully. I spent a portion of my afternoon shopping for new clothes with my children. This was after spending the morning with my father at the doctor’s office. Clothing shopping for my daughters is exciting; I think it is their love language. At 20 and 13 looking for clothes is always fun. They like to spend time looking, perusing, and trying on clothes on, especially when it is mom doing the buying. I can relate, though… I was there at one time, too. I just don’t enjoy shopping quite as much as I used to. My 16-year-old son, however, has a completely different perspective while shopping. Get in, get out, and get on with the day. Done. I am starting to appreciate this part of our relationship. I had to talk him into getting something new because he really did need a different sweatshirt. He is more like his father than his mother in this area and I may or may not be disposing of a certain blue sweatshirt without revealing its status to aforementioned owner at some point in the near future. I went shopping with my dad this morning, too. A little different store with a big difference in the price range. Dad and I went to a big squeaky clean store where some fancy bikes rested under lights and smelled of leather and chrome. I learned shiny silver metal is a totally incorrect way to explain what I like about the motorcycle and that upscale bikes contain lots of Chrome. Just so you know, I chose my favorite based solely on color and it caused a great deal of laughter. My kids wore smiles because they appreciated the gesture of love in the form of a gift. Their gratitude was a welcome consolation for the time spent pushing hangers around and finding the best buy. My dad wore gratefulness as I journeyed with him to a necessary visit, sitting across from one another sharing a meal, and building memories based on laughter and time is a gift only God could know this daughter’s heart was in need of. Can I tell you that looking for new clothes or the impromptu trip to the doctor wasn’t my plan 24 hours ago? Yet, learning how to wear grace well allows us to switch gears in the middle of our well-planned day in order to exhibit the character of virtue and mercy into the lives of others. And a larger part of my heart wonders if we really understand how easy, how simple, it is to wrap grace about ourselves like a mantle and a cloak. Making grace a habitual action, not thinking but acting by our repetitive nature, integrates it naturally into our routine. Grace becomes more than what we wear, it becomes a part of who we are. Last week, I asked you to ponder what wearing grace would look like: What is it that would stand out to you as a virtue or a quality of grace that you see on someone else? Our clothes and the things of this world will change, but He will not. Wearing grace is a reflection of his clothing us in our journeys. The Hebrew word for grace is chesed. It means deliverance from our enemies, affliction or adversity. It shows we are given the gift of being enabled by God through daily guidance, forgiveness, and preservation. 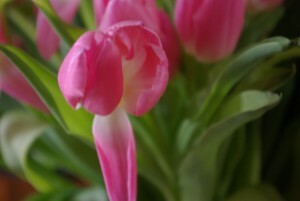 It is likened to the mercy of God displayed through His loving-kindness. The Greek word for grace is charis. It means provision of favor through the means of salvation. It is the unmerited gift of God; love in action towards men who tend to display the very opposite of love in all our actions, or merits. When we wear grace we are literally putting on the virtues of God. We are choosing to be those who extend mercy, enact loving-kindness, enable and guide , display forgiveness and love towards one another. Rather than self-preservation we become those who are bent on preserving the hearts of others instead. We are choosing to do as the Lord did, that Thursday so long ago where He served and washed and put on grace as He took our place so that we could mark our space at His table. This past Saturday, I had the privilege to open my heart and my home to some dear friends and welcome them around my table. The common theme that surrounded our gathering was sharing our need to feel like we belong. It seems to be an anthem we all tend to play at one time in our life. We are not sure we fit. We forget where we belong. We miss grace in ourselves and in others so easily. So we play the parts and we try to fit in where we don’t by changing our wardrobe up a little. Maybe a different outfit or a change in our style. Perhaps a new purse or change in our hair color. Sometimes, we tend to fill in things which never fully last because we are putting on the temporal where only the eternal is created to drape. We settled close together at my table. We spilled hearts of hope and friendship. We communed on the bread of grace as a repast for refreshment. It was a simple, yet wholly elegant, example of transparent authenticity. And when they left, I cried heartfelt thanks that grace was the first garment we put on together in this gathering of our hearts. Whenever we lay out grace upon the table He has called us to serve from, God shows up and clothes us in His goodness. These scriptures in Psalms 45:7-9,13-14, 1 Peter 3:3-4, and Isaiah 61:10 talk about the way we are to wear our garments. All His Word is to us as instructions in righteousness, friends. And the more I considered the connecting and the challenge of becoming women who chose to embrace our gifts rather than be envious of them, I realized we just need to remind each other that we belong solely because of Him. One of the best ways we can wear grace is to remember whose we are. We belong to the King of Kings, friends. When you are the Child of the Most High God, there is no doubt to whom you are connected. And that means that you are family and we need to make space for one another, and be like Dorcas who wove cloth and sewed hope and grace for others because she loved God first. 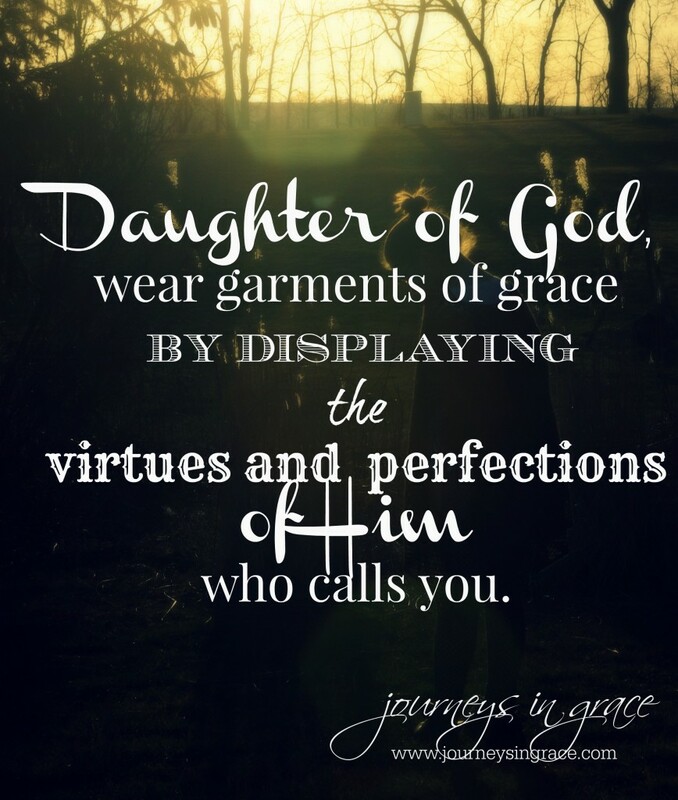 The daughter of God wears raiment that identifies her position and belonging because she displays the virtues and perfections of Him who calls her. 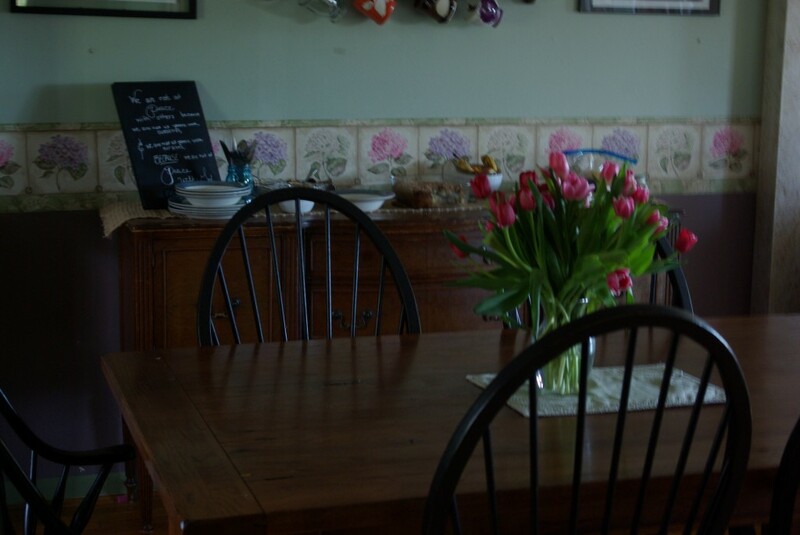 Grace Moments were found at my table here with amazing friends who gathered and shared grace with me when I was brave enough to ask them to come. They were found in the impromptu trips and unexpected visits that connected hearts in largely diverse ways. They are always found as we recollect ways to clothe our souls with the virtues that are incorruptible and unfading through peace and love and grace. Where did you find grace moments this week? Optional Writing Prompt for next week: Where have you seen grace in your friendships? Link up your inspirational and encouraging posts below, or share your blog posts inspired by last week’s writing prompt. It is a daily sacrifice, Shannon! And the more that we make it our habit, the more we wear grace, it becomes easier, doesn’t it? So glad you were here today to share you words. Beautiful truths to ponder today, Dawn. I so pray that my life “displays the virtues and perfections of Him who calls her.” Only as we humble ourselves before Him each day, letting Him do the necessary work, will we reflect Him. May you & yours have a blessed Easter! I pray that prayer, too, Joanne. Actually I found a beautiful prayer in AW Tozer’s book, “The Pursuit of God” that reminded me of this putting on grace and wearing it well. “O God, quicken to life every power within us, that we may lay hold on eternal things. Open our eyes that we may see; give us accute spiritual perception; enable us to taste and see and know that you are good. Make heaven more real to us than any earthly thing has ever been. In Jesus Name, Amen” Praying this for you and those who are visiting here today. I’ve never looked up the meaning of grace in Hebrew. I’m very familiar with the Greek definition. Our lives are filled with grace moments and visiting your lovely online heart is one of them! Beautiful, Dawn. I have a house guest right now for the next 3 weeks who is a bit of a seeker. so lots of grace at our house right now.